You’ve heard the term “publish or perish.” Alas, one can both publish AND perish. This lecture gives one survivor’s perspective on navigating the shoals of academia. It originated from angst generated when I was tenured early, and five of my equally-accomplished friends were denied tenure, despite their having grants and a similar number of publications in similar journals. Reflection on these cases has leant heuristic insights into planning a successful career. This talk has been presented at Bowling Green University, Florida International University, Georgetown University Medical School, Medical College of Pennsylvania, Rutgers University, Society for Developmental Biology National Meeting, the ARVO National Meeting, University of Chicago, University of Kansas Medical School, University of Miami, University of Michigan Biology Department, University of Michigan School of Dentistry, University of Minnesota, University of Oregon, University of Utah, Wayne State University and Wesleyan University. Is the space in front of your poster perennially devoid of people? Do only your competitors come (and take detailed notes)? Do those who do come fail to understand your research? My talk discusses design elements that hinder or enhance your message. These elements are also online at http://tinyurl.com/nbym498 In a half-day workshop, participants apply what they learned from my talk by critiquing posters that others from their school have already presented. In doing so, they practice using a dispassionate critique method that focuses on the issue at hand, rather than on themselves (“I think that...”), on the authors (“They should have ...”) or on the poor defenseless poster (“The poster should...”). This strategy is useful in establishing oneself as a person who focuses on issues, rather than on personal aggrandizement, personal attack, or irrelevance. Mastering this strategy is hard, but putting it into practice in your professional interactions will help you become a respected and valued scientist. The full –day workshop adds an afternoon for participants who have posters in PowerPoint that can be projected for viewing. First, each poster is critiqued by other participants and by me. Then participants redesign their poster and project it for fine-tuning. This event has been presented at Society for Developmental Biology Meetings and The University of Delaware, and (at the University of Miami) a Genetics Department Retreat, a Genome Sciences Training Grant Retreat, a University Graduate School Workship, a Marine School Workshop on Career Success, a Preparing Futrure Faculty Workshop, and a Marine School Workshop on Communicating Science. 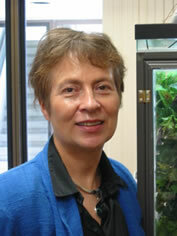 View my research profile on Research Gate at https://www.researchgate.net/profile/Kathryn_Tosney. Photos from my research have appeared in 19 reviews, 54 textbooks, 3 CD-ROMS, and on 7 journal covers. I have given 65 invited research seminars at universities and 24 invited research talks at professional meetings. Neural crest cell migration, axon guidance, the cell biology of growth cone motility. NIH Equipment Grant, Philips CM 10/PC Electron Microscope with Cryostage. PI: Bruce Carlson. Co-Investigators, R. Altschuler, S. Ernst, J. Faulkner, K. O'Shea, P. Raymond, K. Tosney, M. Welsh., 1990. In my lab, research projects range widely, but are centered in the field of Developmental Biology. We often use the neuron as a tool to understand the embryo and its cellular and developmental mechanisms. Some of our projects use classical techniques such as embryonic surgery to discover basic phenomena, such how cell death controls development of entire muscle groups, or how chemical cues guide migrating cells. Some use unconventional systems such as old-world chameleons to understand how development is harnessed to generate different life forms in evolution. Some combine electron microscopy and cell biology to investigate how unconventional mechanisms such as mechanical force regulate axons. Some combine molecular interventions with time lapse digital recordings in cell culture to discover mechanisms crucial to growth and guidance of neural axons. Other interdisciplinary studies examine the regulation and actions of a new cell organelle we recently discovered. My teaching interests currently focus on 1) increasing the availability and wise use of pedagogical tools to increase creative learning, and 2) career development. Some widely adopted pedagogical tools I have developed myself, such as " The Origami Embryo" , a hands-on tool that helps students understand complex shape changes in embryos, and a book using a cross-word puzzle approach to learn terms and concepts. The goal of increasing the availability of effective methods is supported by my role as the Director of the Education site for the Society of Developmental Biology. Here at UM, I teach "Pedagogy and Course Design," which has the immediately practical goal of revising our introductory Biology laboratories. For career development issues, I have long taught a graduate course in presentation and survival techniques, which at the University of Miami has transmuted into "Professional Writing and Grantsmanship," a course in which each student submits at least one grant for outside funding. Nationally, I give talks on "Career Survival in Academia," and run workshops on how to present effective posters (see tutorial and companion site). Two posters about creating good posters are displayed in the Cox Science Centernear the Biology office. Tosney, K. W. , A. Wagnitz, D. Dehnbostel, and K. J. Balazovich (2010). Evidence that growth cones exert mechanical force as they exit the spinal cord. Dev. Dynamics, In press with revision.